Welcome to RentonSwan Vets. 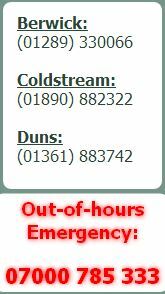 We are a mixed animal practice with centres in Berwick-upon-Tweed, Duns and Coldstream. We have specialist operating and medical facilities for pets and smaller animals at the Ramparts Veterinary Centre in Berwick, and for horses and farm animals at our large animal clinic in Duns. Calls, small animal appointments, advice and medicines are available from all three centres and it is our aim to provide you with comprehensive, locally based care for all your animals.